It’s been an up-and-down season for Spokane Indians starter Jake Latz. The good has been exceptional, surrendering two earned runs or fewer in four of his seven previous starts. On the other side, he’s coughed up six earned or more twice and last week at Salem-Keizer he allowed four earned in five innings. On Sunday, it was “up” again for the 22-year-old lefty. And then some. Latz, who left Saturday night’s game early under the weather, shook off his discomfort and shaved nearly a full run off his season’s ERA in a dominant six innings against the Hillsboro Hops. 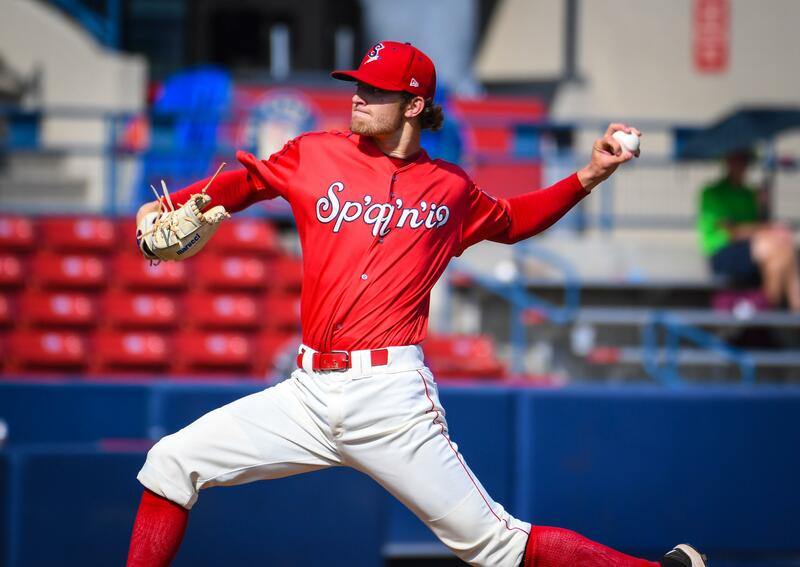 The Texas Rangers fifth round pick in the 2017 draft out of Kent State – a school he never threw a pitch for – allowed five hits and one walk while striking out seven and led the Spokane Indians over the Hillsboro Hops 2-0 at Avista Stadium. Diosbel Arias went 2 for 4 with an RBI, a run and a double. Hillsboro (4-2), which won the South Division first-half title, leads the South by two games. Latz shook off not feeling well as part of the game. Latz was not eligible for competition in a redshirt season after transferring to Kent State from LSU. Scouts who saw him pitch in practice were impressed enough to encourage the Rangers to draft him anyway. He’s still learning how to pitch after missing so much time while in college. “If you dig in and see the process and the adversity he’s been through, there’s a lot more admiration and appreciation for what he’s doing right now,” Holmberg said. The Indians staked Latz (3-1, 4.97) to a lead in the first inning. With two down, Curtis Terry’s ground ball stayed fair down the third base line and the big man rumbled into second with a double. Diosbel Arias followed with a looping single to right center and Terry beat the throw home easily. Latz retired the first six in order. In the third he walked Dan Swain and Will Gorman followed with a single. But Latz got three straight outs to escape the jam. The Indians’ Cristian Inoa led off the fifth with a double to the right-center gap and Hasuan Viera walked. But Starling Joseph’s grounder to third forced Inoa, ending Hillsboro starter Luis Frias’ day, then J.P. Martinez and Terry struck out against Luis Castillo to end the inning. Frias (0-1, 2.08) was making his NWL debut. He pitched in seven games (six starts) with Diamondbacks’ rookie-level Arizona League team earlier in the season and went 1-1 with 2.48 ERA with 31 Ks over 29 innings. Latz retired seven straight in the middle innings before back-to-back one-out singles in the sixth. He came back to strike out cleanup hitter Joey Rose and Keshawn Lynch popped out on the infield to end the inning – and his afternoon. Arias led off the bottom half with a double to center, his second hit of the game, and went to third on a long fly out by Jax Biggers. Francisco Ventura then bounced one through the box for an RBI single. The inning ended on a double-play grounder by Troy Dixon. Reliever Cole Uvila provided 2 2/3 shutout, hitless innings – though he issued a pair of walks and hit a batter – and Emmanuel Clase faced one batter – a strikeout of Gorman with two on in the ninth – to earn his seventh save. Published: July 29, 2018, 6:47 p.m. Updated: July 29, 2018, 7:14 p.m.